Cover with plastic wrap and let stand overnight at room temperature for 10-12 hours or longer. In the morning, place a Dutch oven with lid in a cold oven and preheat to 450° F. My oven takes 35 minutes to reach 450°. When oven reaches 450° place dough on a well-floured surface and sprinkle with a little flour. Using a scraper fold dough over 10-12 times & shape into a rough ball. Place on a piece of parchment paper and carefully lift and place into the hot pot. Cover and bake for 30 minutes. After 30 minutes, remove lid and parchment paper. Return, uncovered, to oven and bake 10 - 15 more minutes. Bread Too Dense? 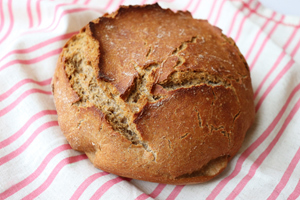 Try 2 cups of whole wheat flour + 1 cup of all purpose or bread flour for a softer loaf. 62 Comments on "No Knead 100% Whole Wheat Bread"
this looks very good. i’m going to try it have you had any success with adding dried fruit or olives or nuts? I do not find info about the plastic wrap. mine does not stick to the container, so I put a lid on top. As long as it’s tightly covered it’s okay. Jenny, been watching you cook for a while now….and thank you for keeping humor in the kitchen…I think that’s always a sign of a cook who really enjoys cooking ! Me too!! And me too from polish descent … but my question is the pans you’re using with the wooden handles, can you share the brand name and where you found them please?? And are they cast iron? Thanks again ~ just received your cookbook too! Thanks for That also! 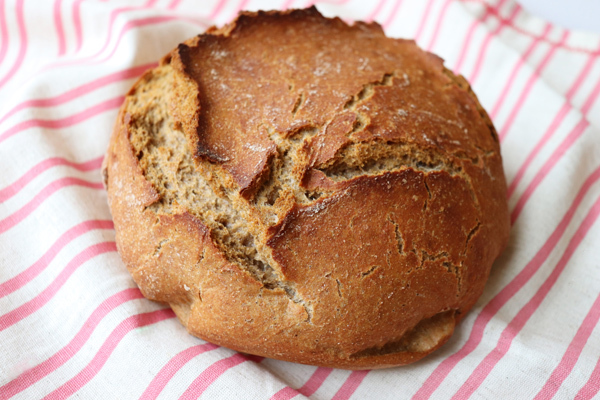 Can you do this recipe with 100% dark rye flour? It works so well with 100% whole wheat which has somewhat the same characteristics in terms of gluten as rye. What do you think? Hi Jenny, You are very entertaining as well as charming. Read your Bio and fell in love with you because of your fight for independence, generosity, and humor despite all you went through in your younger years. Now that ” grandma” has given you her “speel”; Love your recipes because it brings back so many memories! I am first generation Polish AND PROUD! My husband likes honey wheat bread. Can I add honey to this recipe? If so -how much? Is it possible to use dough enhancer? I have never used it so I don’t know. Please look through the comments to see if anyone else has or you may have to research this further online. I’ve tried this recipe twice now using 2 cups whole wheat flour, 1 cup all purpose flour, and adding 1 cup of sunflower seeds. The bread turned out amazing. Gonna try the No Knead Bread next as my husband does not like whole wheat bread (more for me!). Thanks Jenny! I’ve made your white bread many times and is a favorite in my house, so incredibly easy and delicious. I am going to make the wheat loaf as I prefer wheat, but also love nuts and seeds in my bread. At what point would I add say chia, flax, sunflower, sesame seeds to the loaf? Thanks so much for this recipe. It is truly wonderful bread. Like you, we can never let it cool very long without devouring it!! I add any additions right at the beginning, when mixing the flour/water, etc. together. Thanks for the reply, Jenny! Do you treat the grain/seed additions as “flour” and reduce the flour accordingly or not? I do not reduce the flour when adding seeds, nuts, etc. Can you use Gluten Free Flour or Coconut Flour instead of regular (white flour?) I can’t have white or enriched or bleached flours.. just curious if you’ve ever used any substitute for white/regular flour? I never have and I don’t think this recipe will work without gluten but you could check around for gluten free no knead bread recipes. Coconut flour is incredibly DRY in my experience. Good luck with any combination of using it. Would love to read a successful recipe. My big old house is cool in Winter, I just got a Brod and Taylor bread proofer, what temperature would you say I should set it on, I’d rather proof in the box as opposed to at room temperature, makes me feel more secure, LOL. Thank you, love your cooking info and videos. This method of bread baking is not intended for rising in a warm spot. It actually needs to rest at room temperature. You can easily research more about this “no knead” method on the internet as it’s very popular. I will definitely bake this. love to try baking a bread. as I’m just starting to learn how to bake @ home.My husband wants to taste all my baking 🙂 he loves that I’m now on this hubby and my son who visited me last Christmas from Ireland buy me Kitchen Aid to help on all the baking I will make.Love it! can i use white wholewheat flour without changing the recipe? I have never used white whole wheat flour but I believe it bakes like whole wheat flour. However, if the mixture isn’t soft and sticky at the beginning you could always add a little flour or water top adjust if needed. I am a young mom of two.. So Impressed with your enthusiasm for cooking.. Well when I bought active dry yeast , it came as small round granules. Shall I use it as is with Hot milk for Whole Wheat and All purpose for breads? or should I dissolve it in warm water separately and then mix it into the flour? I use active dry yeast the same way I use instant yeast and I do not proof either one before using. Do you think a stainless steel pot would work for your no knead breads? I’m still a begginer and don’t have a lot of kitchen tools yet. I have only used an enameled cast iron dutch oven but I have researched online and other people claim to have success using: glass pyrex dish with a lid, stainless steel pot with a lid, clay baker, pizza stone with a stainless steel bowl as a cover. Keep in mind that the lid must be tight fitting and have an oven-proof handle. hi jenny,if I don’t have. a dutch oven can I use a round roaster,also could I use tin foil instead of parchment paper. The pot you use must be rated to withstand 450 degrees F but foil will not create the tight seal you need to “steam” this bread. Hi Jenny, I love your youtube videos, you are so humorous. I have a few questions of making breads. Some bread needs to be kneaded for a long time , but some don’t. what are the differences? Also what are differences of the resting time of the bread dough? I can see the requirement time range from 35 mins to 18 hours. very confused. There are so many ways to make bread. Some use two rises, some only one rise (like mine). Some require kneading for ten minutes while others only 50 turns. Then there are breads that are baked in Dutch ovens that require no kneading. Except for Dutch oven no knead breads, yeast breads do require some kneading. Bread enthusiasts will knead for a long time but the invention of instant yeast has helped reduce kneading time. In general, you usually only have to knead until the dough is smooth and elastic. Yours is a very broad question but I can tell you that each recipe will be different and you should follow each recipe as written. Thank you Jenny for your quick reply. The recipes of yours that I have tried so far have been great! I look forward to trying this one… Can you tell me about parchment paper… Why do I need that and (if I don’t have it or may not want to use it) is there a work-around. With no knead bread, if you don’t use parchment paper you have to transfer the dough using a floured towel and I found it very difficult because the dough sticks to the towel, even when it’s well floured. (Reynolds brand parchment works a lot better than the cheaper ones) If you don’t want to use parchment, look for a no-knead recipe that uses a towel to see how it’s done. Lubricate a small 8 -10 inch nonstick pan with a handle and use that to do your 2nd proof, then when ready transfer directly into the dutch oven. So easy Jenny will be embarrased she didn’t think of it herself. Your bread is fool proof and easy. Tried it on my Italian boss and he said it reminds him of the same bread he had in outskirts of Philly that was soooo good and they changed the recipe and no longer available. I look forward to trying out your other recipes. Slam dunk on this one. Thanks for your generosity of sharing your recipes. I have a bread machine at home. How do I convert this no-knead recipe to the bread machine recipe? Appreciate your response. I don’t believe it’s possible to use this recipe in a bread machine. This dough requires a very hot oven as well as a pre-heated pot and lid. This method creates steam inside the pot and that’s what cooks the bread. If you have a dutch oven or another pot with a lid that is oven-safe up to 450 degrees f, I think you will find this recipe even easier than a bread machine. What size dutch oven is best to use? I use a standard dutch oven, which is about 9 inches across the bottom. I wish you would make a whole wheat video. What brand of flour do you use? My video for this bread is coming soon. I use any whole wheat flour I can find. My store currently sells King Arthur brand so that’s what I’ve been using. HELP! this recipe was a disaster! From the very minute I was adding the water and stirring it into the flour I knew it was WAY too dry.. but I didn’t want to go against the recipe, so I did as it said after both reading and watching the video. I am at the second hour, but so far the dough has barely changed in size and there are definitely NO bubbles … it doesn’t look anything like your video. I will go ahead and cook it, but it will probably be hard as a rock… WHAT did I do wrong??? In the video for the white bread, as you were adding the water, the flour was getting REALLY sticky, which you said was a good thing. This whole wheat flour was nothing like sticky.. more like parched and cracked… and I measured the 3 cups and leveled off with a flat knife, so I feel I followed exactly. The whole wheat flour mixture will not be as soft as the bread flour mixture and may not be as puffy looking after it rests but mine still bakes up nicely every time. Please let me know how it turned out in the end and if it really was a disaster, I will try to figure out why. Thanks. Mia, whole wheat will be dryer – Flour 101. Try adding some olive oil (2 Tablespoons) and see what happens. I assure you I pay attention to detail in the recipes I share. My whole wheat loaf uses 1 1/2 cups of water but it’s possible that whole wheat flours are not the same everywhere. If your flour is more dense & heavy, you may need a little more water. And keep in mind that a loaf made with 100% whole wheat flour will behave differently than one made with all-purpose or bread flour so don’t expect the mixture to look like the one in my original video. But the end result is a rich “farm bread” loaf that I love. Thanks for the easy spaghetti and meatball recipe; It led me to your must try quick whole wheat soft bread. I look forward to baking it soon. I’ve missed your great smile and charming way. Looking forward to your holiday recipes. Hi Jenny do you have any gluten free recipes thank you. I wish I had an alternative but I don’t know of one. I looked around online for other recipes for no knead bread but I could not find a proven alternative. Sophie, I have made this in an ovenproof glass baking dish and covered with an ovenproof plate that fits over the baking dish. I’ve seen a few videos where they just use a sheet pan for the bread then put a frying pan on the bottom rack with plenty of water in it to create the steam affect. It worked for me, then I bought a lodge cast iron pot. They’re way cheaper the the le crusette. Sophie – go to “you tube.com” and find Artisan Bread with Steve – he shows different vessels you can use besides the dutch oven. Personally, I like Jenny’s the best. I can only find wholemeal flour in my grocery stores. Am I allowed to use wholemeal flour for the recipe? Yes. Wholemeal flour is the same as whole wheat flour.